Food service staff from across the Auburn School DIstrict take part in a flavor-enhancement training. The hallways and classrooms of Auburn Riverside High School may have been deserted on March 11, but the kitchen was abuzz as more than two dozen food service managers learned fresh approaches to creating healthy meals for students. With kids out of school for a staff development day, cooks from across the school district in Auburn, a suburb south of Seattle, picked up tips to spice up their recipes – from tossing fruit salad with cilantro and lime, to roasting carrots instead of steaming them. When the dishes were done, the verdict was in: The salad could use more citrus. But no one mentioned salt. The goal of the training was to show participants how to enhance the flavors of food without reaching for the salt shaker. It is part of a larger initiative led by Public Health – Seattle & King County and the Center for Public Health Nutrition at the University of Washington School of Public Health to implement strategies to reduce the amount of sodium people consume and to improve public health. According to the Centers for Disease Control and Prevention (CDC), about 9 in 10 children in the United States, ages 6 to 18 years, eat too much sodium daily. The majority of salt in the American diet, more than 70 percent, is from processed or restaurant foods. Studies have shown that eating too much sodium is linked to high blood pressure, a serious health threat that could lead to stroke, heart disease and heart failure. It is also associated with increased risk for diabetes and obesity. The Seattle and King County project is one of eight efforts across the country that are part of the Sodium Reduction in Communities Program, funded for five years by the CDC’s Division for Heart Disease and Stroke Prevention. The end goal is to reduce sodium in the food supply and in large scale food service. The project is in its third year. Chef consultant Cathy Powers shows food service staff how to toss fruit salad with cilantro and lime. 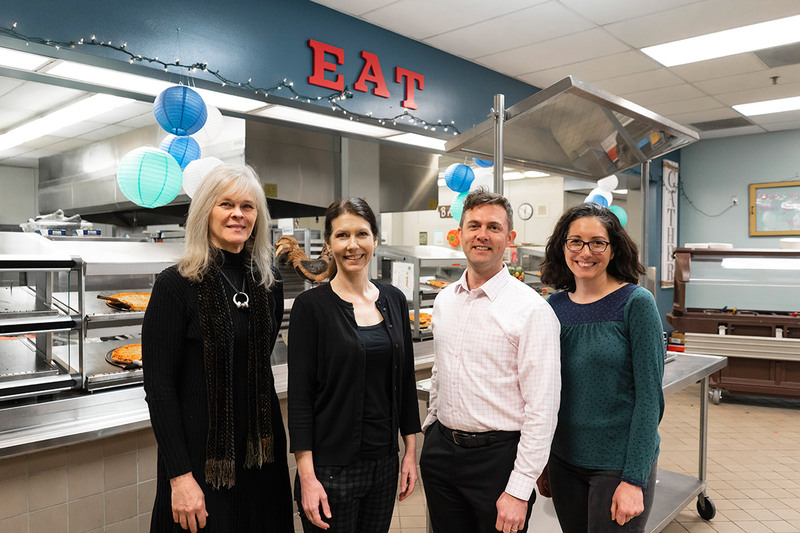 For the first two years, researchers partnered with the Renton and Highline school districts – both located in south Seattle – to implement behavior-change strategies that nudge students toward making healthy choices in their school environments. They also worked with the districts to purchase lower-sodium ingredients and to develop new, lower-sodium recipes. Compared to sodium levels of student meals at the start of the project, average sodium consumption decreased after the intervention for most food categories, including cold sandwiches, rice bowls and burritos. In a one-week sample, post-intervention sample, 12 percent of student meal selections were lower sodium. ”It’s important to employ a variety of strategies to effectively reduce sodium while encouraging students to try new foods and participate in school lunch,” said Mary Podrabsky, an SPH dietitian, clinical instructor in health services and research coordinator in the Center for Public Health Nutrition. Podrabsky provides implementation and evaluation support for the school sodium project. One such strategy used in 28 schools across both districts were “flavor stations,” where students could select low and sodium-free herbs and spices to boost food flavors. Both districts procured lower-sodium ingredients such as ketchup, beef patties and tomato soup. They also tested new recipes – some developed by students – that featured more local products and spices from around the world. SPH researchers and local public health practitioners are now building on these learnings in Auburn. They’ve partnered with the school district’s culinary nutrition specialists to build flavor-enhancement skills among food service workers, find lower-sodium alternatives to some ingredients and create more “ethnically inspired” recipes. Researchers will later evaluate how these interventions change the way students select and eat lower-sodium foods. “We want the recipes used in schools to include foods and flavors that are familiar and interesting to the student population,” Podrabsky said. 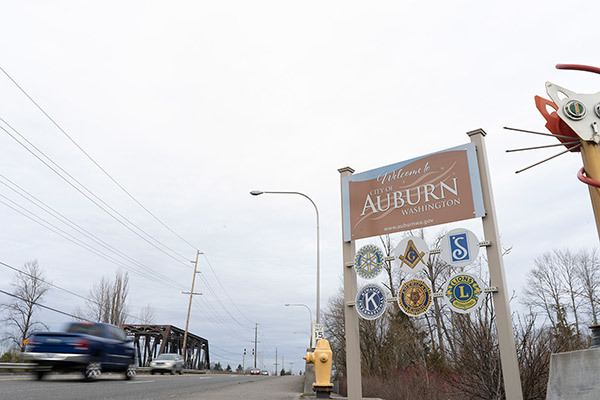 More than 100 languages are spoken across Auburn. Some ethnicities and nationalities represented include Hispanic/Latino, Russian, Marshallese, Native American and Ethiopian. Adds Ben Atkinson, the school district’s dietitian and coordinator for child nutrition: “Recipes should follow what we all strive to eat – a balanced diet that includes lean protein, vegetables, whole grains and healthy fats. But we also want to get kids excited about eating different, healthier kinds of foods.” On the menu recently at Auburn Riverside was a coconut curry. Key findings from the project are shared with a learning network, which includes the Auburn, Renton, Highline, Seattle, Bellevue and Kent school districts. The group meets monthly to discuss how to implement successful interventions. The most recent Dietary Guidelines for Americans recommend that most people ages 14 and older should consume less than 2,300 milligrams (mg) of sodium per day, about one teaspoon, as part of a healthy diet. Intake below this level is recommended for children younger than 14 years old and people who have high blood pressure. However, a new report released March 5 by the National Academies of Sciences, Engineering and Medicine slashed recommendations for sodium consumption to 1,800 mg daily or less, depending on age. The Auburn project team includes (L-R) Mary Podrabsky, Janis Campbell-Aikens, Ben Atkinson and Kate Ortiz. So what food item do school nutritionists worry about most? Janis Campbell-Aikens, director of child nutrition for the Auburn School District, says: “Deli sandwiches are by far the highest-sodium item in our schools.” Campbell-Aikens and Atkinson agree that priority over the next year is to source lower-sodium lunch meats and breads or wraps that still taste good. If they learned anything from the food service training, it’s that bold flavors don’t have to hurt the bank or the body. The project team is also working to reduce sodium in the food supply in King County emergency food settings, such as food banks and meal programs. They are working to make changes in policies, procurement guidelines and behavioral-economics strategies that make it easier and more appealing for clients to select healthy foods. The project team also includes SPH’s Jessica Jones-Smith and Emilee Quinn, as well as Public Health – Seattle & King County’s Mariel Torres Mehdipour and Kate Ortiz. Three team members, Podrabsky, Atkinson and Ortiz are all graduates of the School’s Graduate Coordinated Program in Dietetics. This story was first published on the University of Washington School of Public Health website in March 2019. Republished here with permission.